Sara Slayton will again be teaching her Storytelling for Adults class at the Weber Center February-April 2019. Contact Sara at sara.slayton@gmail.com or 608-797-2807 for more information and to enroll. La Crosse’s Storytelling Festival’s Luna is a story slam similar to NPR’s Moth. Local tellers share a story or two and then audience members are encouraged to tell five minute prepared ‘true-ish’ stories based on the evening’s theme. Tellers and listeners are welcome and needed. Venues have included Pearl Street Brewery and the Pump House. Check the POSTS on this web site for dates and information about our next Luna. An annual fund raiser for the Festival, Tales in the Tent highlights local tellers in interesting locations. Originally held in a tent, thus the name, this event has been held at historically significant locations for the past eight years. Besides listening to wonderful stories, guest are treated to wine, coffee, and delicious appetizers and desserts prepared by the Bluff Country Tale Spinners. Check out the POSTS on this web site for the date and location of this year’s Tales in the Tent. In the storytelling world, Telebration is held in November. This year will be the first Telebration for the La Crosse Storytelling Festival. 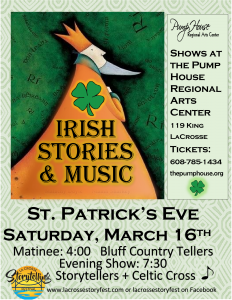 Local and regional tellers will share a variety of stories for all ages at the Pump House on Nov. 14. Each May members of the Bluff Country Tale Spinners provide stories for kids preschool and up at Myrick Park. Schools are encouraged to book their time early in order to get the time and date they need. Children who are not yet in school or are home schooled are welcome to attend also. For more information or to book a time, contact Sara at sara.slayton@gmail.com or 608-797-2807. Host of the La Crosse Storytelling Festival, the Bluff Country Tale Spinners, is a local guild whose mission is to encourage the art of storytelling. BCTS meet the second Thursday of each month at King Street Kitchens in La Crosse at 7:00. There is a short business meeting followed by stories. All level of tellers are welcome as are story listeners. If desired, tellers are given feedback on their story in a warm and welcoming environment.